Experimenting with a little translation of a different sort. There's an excerpt from one of the Carmina Gadelica prayers making the rounds (without credit to the source of course*) and when I took another look at the original Gaidhlig I realized that Carmichael's translation was more poetic than literal. I don't have any Gaidhlig myself but it's close enough to Sengoidelc that I can actually read it most of the time, and I could see certain things jumping out. I decided for fun to do my own translation with the help of Am Faclair Beag. Is nan ce agam air. And of the worlds I have over it. And of the world have I. *for those who don't know the Carmina Gadelica is probably the most widely plagiarized material I see in the Celtic pagan and general witchcraft communities. People constantly post pieces of material from it either altered to be more pagan and then labeled "ancient" or using Carmichael's translations word for word but the person circulating it claiming to have written it. Recently a friend of mine wrote two very insightful blogs 'The Line in the Dirt' and 'Deepening the Line'. 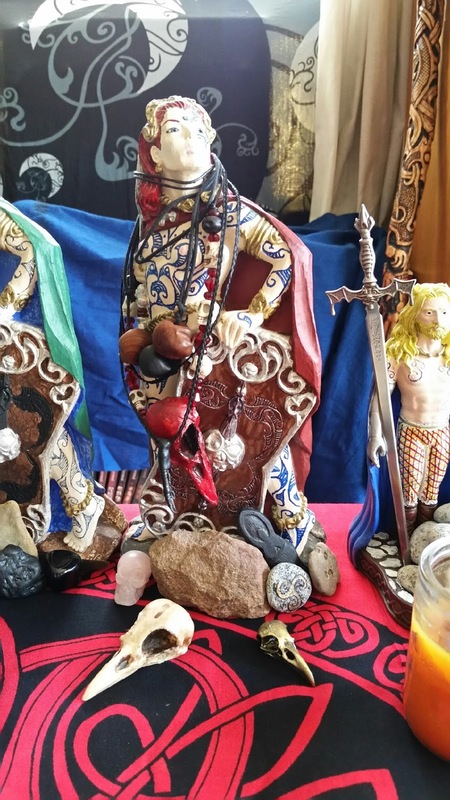 Both deal with looking at the way the pagan community, in general, approaches magical and ritual practice, the laziness that's rampant among practitioners, and the idea of what happens beyond basics. I've been thinking a lot since I read them, both because she raises some good questions and because she makes good points. Although we don't often like to admit it many people don't keep up with the basic practices that they learn early on. The things that may be seen as boring or routine tend to slowly erode from daily and then weekly practice until we have long time practitioners who don't know how to do very basic things, not from ignorance but from lack of practice. Like any other skill to be good at witchcraft and ritual requires effort and practice, not once in a while or when a situation calls for it but constantly. You can't be good at anything if you aren't doing it on a regular basis. The blogs also raised some excellent points about trusting our gut, both to seek genuine experiences and to know when someone is on the level. I think this is something that needs to be emphasized a lot more in the community. Too often we don't trust our gut but let politeness, expectation, or other people's opinions guide us, when it should be our own internal compass that we follow. If something magical or in ritual doesn't feel right, don't do it. If a person is supposed to be a great ritual leader or teacher but what they are doing or saying just doesn't gel with you then don't pretend it does (although you can be nice about it). I don't personally care how well known, well liked, or well respected a teacher is - if what they are saying rings false with me then I trust that feeling. If you are in ritual and you just aren't feeling or experiencing anything numinous then trust your gut about what you are feeling, rather than trying to force an experience you aren't actually having. I have stopped a ritual midway when I felt like absolutely nothing was happening, and I have changed the entire ritual plan during a ritual when the actual energy proved to be much more mellow than anticipated. Trust your gut people. I'll also add that when dealing with spirits and Otherworldly beings your gut is often a lot smarter than your head. The biggest issue that caught my attention in the blogs though wasn't something explicit but something underlying a lot of the wider points being made. Why do our leaders and teachers let us down? Why are we dissapointed when the people we idolize can't actually do the things they claim they can? Why do we let the basics slip so easily? And I think in the end it comes down to one simple thing that I see as a very widespread occurrence throughout the pagan and witchcraft communities - people want everything handed to them in neat little lesson plans and easy to follow books. And that's fine to a point because we all start somewhere and in the beginning especially those lesson plans and books are our stepping stones and guide posts. We need them to find our way. We need teachers who can show us what to do and how to do it. But the problem is that a time comes when the training wheels have to come off, whatever religion or magical practice you follow, and you have to start doing for your self. The nicely maintained road ends and only the trackless woods remain, and its up to you, by yourself, to forge on anyway. And many people don't like getting sweaty and dirty. They don't like the lack of certainty, the dark unknown, the unanswerable 'what now?' that looms ahead of them. People want a life that is neatly ordered and organized, and especially in witchcraft, at least my witchcraft, there is none of that. I can teach you the rules of safety but I can't promise you'll be safe - in fact I can almost guarantee if you are actually out there doing then you will stumble and fall and get hurt sometimes. I can describe the experiences, but I can't experience it for you, anymore than telling you what dirt under my fingernails feels likes can really make you understand the sensation of it. You have to get out there and get dirty, dig your fingers into the earth, make your own trail, your own experiences. No one else can do that for you. So go out, my friends, and get your hands dirty. 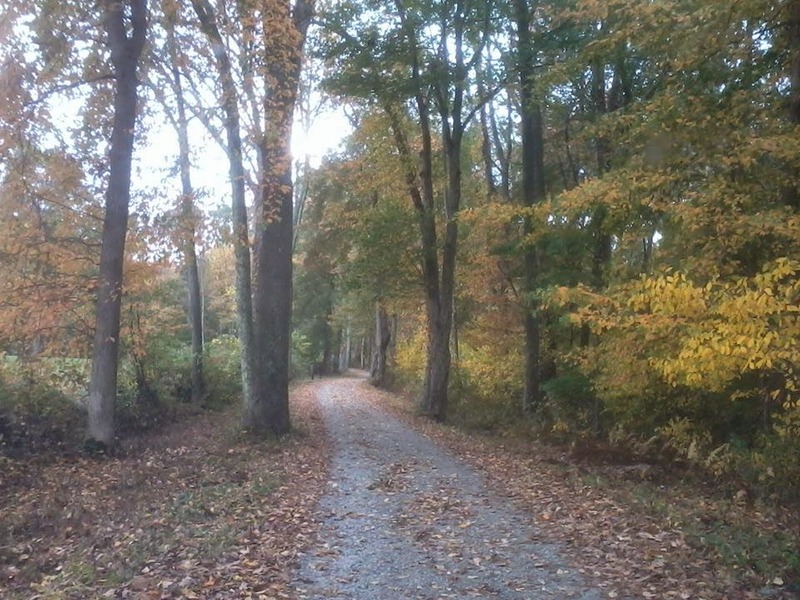 Walk into those woods, where the trail ends, and make your own way. It won't always be easy and it won't always be fun - although you may be surprised how often it is - but it will be worth it. Many people are familiar with the Norse God Odhinn, but less well known is his German counterpart Wodan who is similar but not identical. Wodan (Old High German Woutan) although almost certainly derived from the same root as Odhinn has several distinct characteristics. In today's blog I would like to discuss Wodan as we see him in the German material. 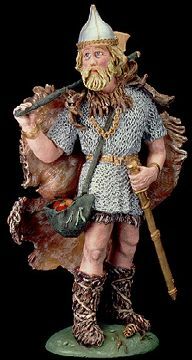 The name Wodan or Wotan comes from Woutan which is from the older Indo-European root wodenaz, meaning "raging, mad, inspired" (American Heritage Dictionary, n.d.). It is from this deity name through the Old English that English speakers get the word "Wednesday" - Woden's day - although this has been lost in German, replaced with Mittwoch (literally "middle week"). And this root is also where the name Odhinn comes from. "If we are to sum up in brief the attributes of this god, he is the all-pervading creative and formative power, who bestows shape and beauty on men and all things, from whom proceeds the gift of song and the management of war and victory, on whom at the same time depends the fertility of the soil, nay wishing, and all highest gifts and blessings" (Grimm, 1888). Broken on the wheel and hanged. You must go away from here. (Gundarsson, trans. Höfler; Berk, & Spytma, 2002). In the end then when we look at the German Wodan we see a complex deity who is both a god of the abundance of the harvest and the fearsome leader of the Wild Hunt, a god of fertility and feeding the living as well as of death and the dead. Ultimately we can say that he rewards those who show him respect and earn his favor, but punishes - even torments - those who offend or insult him. While in some ways he resembles his Norse counterpart he also has distinct features as well, which should be appreciated. 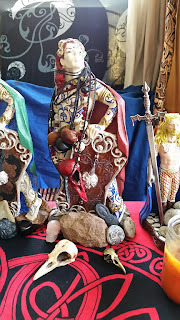 One question that I am asked on a fairly regular basis is what should people who are interested in connecting spiritually to the Morrigan or who are just beginning to honor Her do? So I thought it might be helpful for me to post a list of general suggestions here, although keep in mind that these are only my ideas and what I have found works well for me. I tend to be a very sensory person so you'll note a lot of this involves sensory experiences - sound, sight, touch - and that may appeal to some people and not to others. Obviously the very first thing I'll suggest is to read as many of the old myths and stories as you can, preferably as close to the originals as possible. The re-tellings are nice, like Lady Gregory's Gods and Fighting Men, but they often take liberties with the stories and change details that make big differences. You can find many of the older stories at Mary Jones Celtic Literature Collective and the stories which feature the Morrigan especially include the Cath Mag Tuired Cunga, Cath Maige Tuired, Lebor Gabala Erenn, and many of the tales in the Ulster Cycle. Beyond that there are several modern authors who have written in detail about the Morrigan that are worth reading - my favorite is Angelique Gulermovich Epstien's "War Goddess: The Morrigan and Her Germano-Celtic Counterparts". If possible you should go and visit the places the stories happen in. Smell the air, touch the earth, feel the wind. Stand in the places that the Morrigan herself is said to have stood in, is still said to stand in, like Uaimh na gCat, and feel her presence there. If that's not possible then quiet meditation wherever you are is good, but I am one of those pesky people who thinks going to Ireland should be a goal for those who follow herself. Even if its a once in a lifetime goal. Until then of course you can do your best to feel connected to the locations of the myths, to the places where the Gods are invested in the land itself by learning as much as possible about them. Set up a small shrine to her. I'm a fan of statues and artwork and there is a huge amount to choose from for the Morrigan. My favorite statue is Dryad Design's Morrigan, which I bought and then painted myself. There are also a variety of great art prints out there. Beyond that personalize as you see fit. I like shrines because they provide a quiet place to sit and visually reflect on the Gods, as well as being a place to light candles, burn incense, and make offerings. Speaking of making offerings. A good way to establish a connection to any deity is to begin making offerings to them. For the Morrigan my own preferences are milk (or cream), whiskey, or bread, although I often offer different things spontaneously as well if I feel drawn to. Pray. This tends to be less popular with some people but it really is a good way to connect. Whatever works best for you, whether that's formal memorized prayers or spontaneous speaking from the heart, the point is just to reach out and speak to the Gods. Music. I really love music as a vehicle for altered states, trancework, and just plain feeling more strongly connected to something. When it comes to the Morrigan my personal favorites are Omnia's Morrigan, Darkest Era's The Morrigan, Heather Dale's The Morrigan, and Cruachan's Brown Bull of Cooley and The Morrigan's Call. My final suggestion would be to get a piece of jewelry that represents or symbolizes the Morrigan for you, that you can wear to help you feel more connected to her. This is largely a psychological thing for the person, a physical token to touch when you need that tactile reminder. Over time though it can become sacred in its own right as its blessed or empowered. So there you go, a short basic list but one that I find effective. Many or most of these may just be common sense but I have found they are all helpful, especially if done regularly. Having a regular spiritual practice is vital in my opinion and this is how I incorporate the Morrigan into that.